The report is from the US Department of Labor, Bureau of Labor Statistics. Nonfarm payroll employment rose by 157,000 in July, and the unemployment rate edged down to 3.9 percent. Job gains occurred in professional and business services, in manufacturing, and in health care and social assistance. 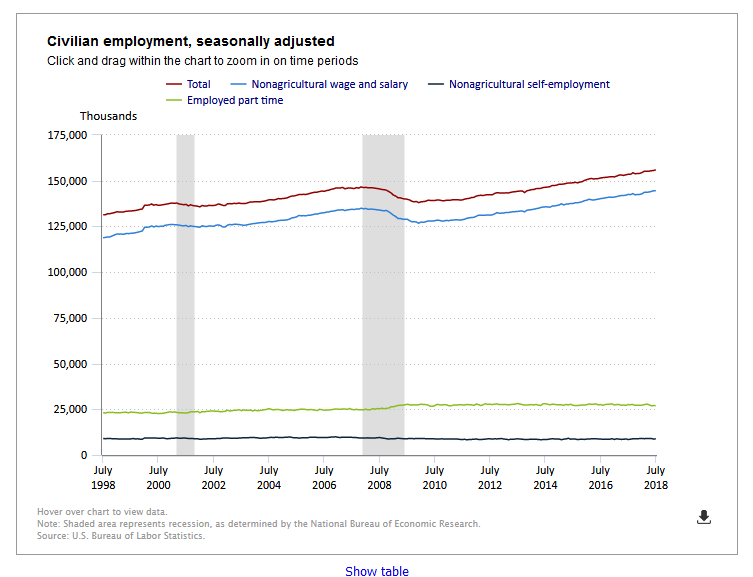 Incorporating revisions for May and June, which increased nonfarm payroll employment by 59,000, monthly job gains have averaged 224,000 over the past 3 months. This information is show graphically in Charts 1 and 2 below. Employment in professional and business services increased by 51,000 in July. Within the industry, employment edged up in temporary help services (+28,000) and in computer systems design and related services (+8,000). Over the year, professional and business services has added 518,000 jobs. Manufacturing added 37,000 jobs in July. Nearly all of the gain occurred in the durable goods component. Employment increased in transportation equipment (+13,000), machinery (+6,000), and electronic instruments (+2,000). Over the year, manufacturing has added 327,000 jobs, with four-fifths of the gain in durable goods industries. Employment in health care and social assistance rose by 34,000 in July. Health care employment continued to trend up over the month (+17,000) and has increased by 286,000 over the year. Hospitals added 7,000 jobs in July. Within social assistance, employment in individual and family services increased by 16,000 over the month and by 77,000 over the year. Employment continued to trend up in food services and drinking places in July (+26,000); the industry has added 203,000 jobs over the year. In July, construction employment also continued on an upward trend (+19,000). The industry has added 308,000 jobs over the year. Overall, employment in retail trade changed little in July (+7,000). Job gains occurred in general merchandise stores (+14,000), clothing and clothing accessories stores (+10,000), and food and beverage stores (+8,000). These employment gains were offset by a decline of 32,000 in sporting goods, hobby,book, and music stores, reflecting job losses in hobby, toy, and game stores. Employment in other major industries–mining, wholesale trade, transportation and warehousing, information, financial activities, and government–showed little or no change in July. Average hourly earnings of all employees on private nonfarm payrolls rose by 7 cents in July to $27.05. Over the past 12 months, average hourly earnings have increased by 2.7 percent. From June 2017 to June 2018, the Consumer Price Index for All Urban Consumers (CPI-U) increased by 2.8 percent (on a seasonally adjusted basis). 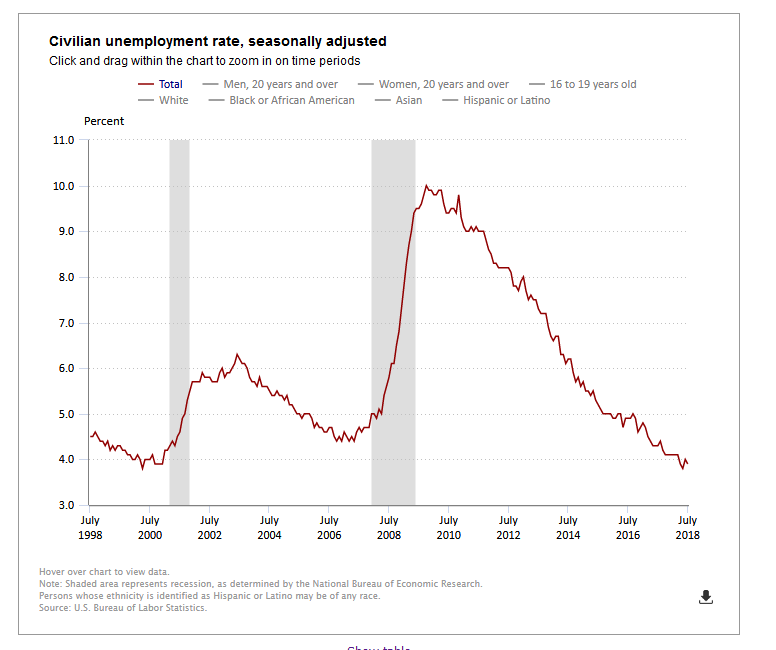 Turning now to data from our survey of households, the unemployment rate edged down by 0.1 percentage point to 3.9 percent in July, and the number of unemployed people decreased by 284,000 to 6.3 million. These declines were concentrated among adult men and largely offset increases in the prior month. 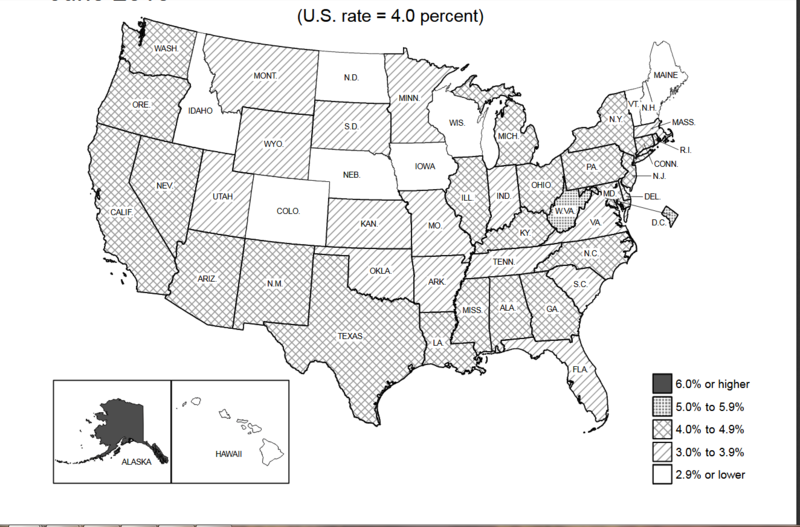 Statewide unemployment rates are show below in Map 1.